there are challenges on this adventure! A mountain bike and helmet are included in the tour price. Around 16:30 at meeting point. What to bring:sunglasses; sun-cream; shoes for cycling; swimming gear. Of course, water, soft drinks, seasonal fruits and snacks are all included and we supply the International standard mountain bike and helmet. 08h00-08h30: We will pick you up at your hotel in Phong Nha to go to the starting point for briefing and to review the rules on village roads. 08h45: Leave the town for Phong Nha National Park. Cross Xuan Son bridge for the topview to Phong Nha town over Son river. 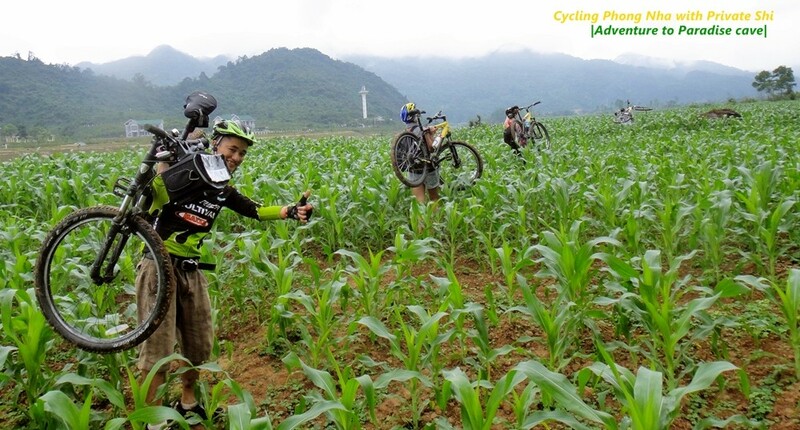 You will be passing the local corn and rice fields, and cycling along Son River to explore Na village, which is known for the floating fishing farm. Stop enroute to learn the local culture, how the rice is grown and how the villagers feed their fish in the river. At the end of the village, carry your bicycle across the corn fields to get to the boat landing. Your shoes will be getting muddy if it is a wet day! From here, a B-52 boat will transfer your bicycles to the next station. Meanwhile, you will do a short hike through the corn and peanut fields. Hop on your bike again and back on the road. 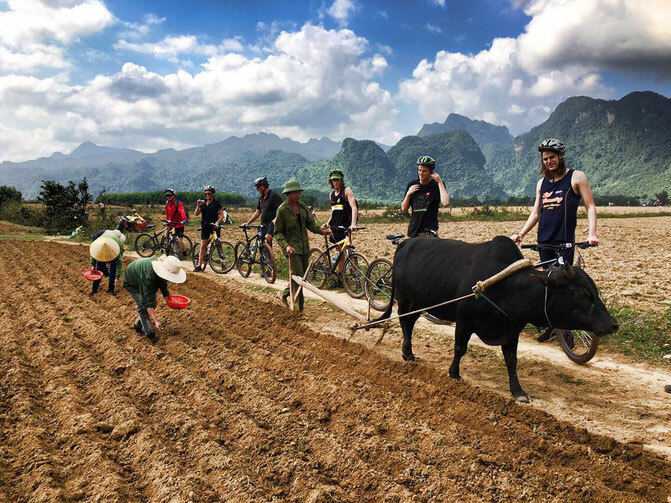 Pedal to get through a nice peanut field and reach Ho Chi Minh original trail, which facilitated the movement of soldiers and war supplies from North Vietnam to battlefields in South Vietnam. 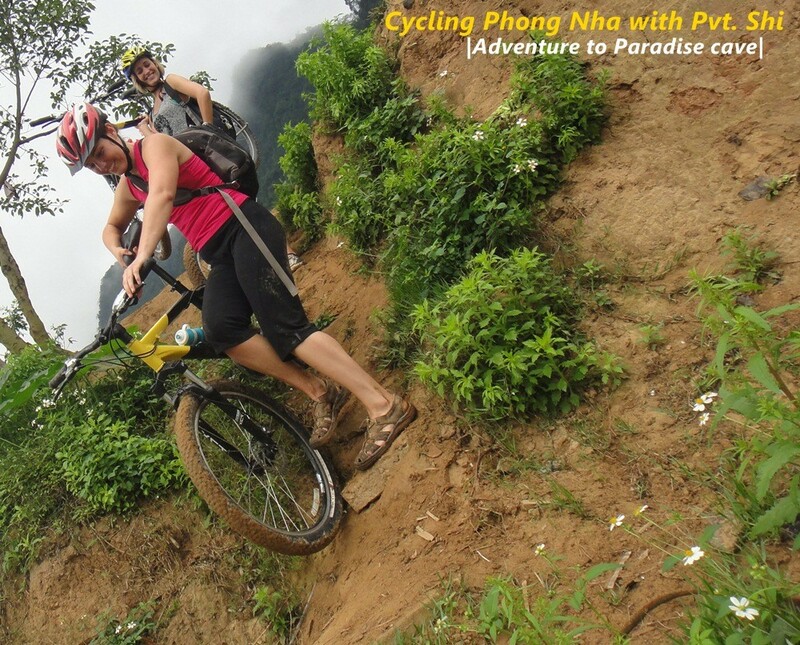 There is not only one or 2 Ho Chi Minh trails. Our guide will tell you more about those than C.I.A. Make sure your hands are tight enough to conquer this tough trail before crossing to another muddy path through the peanut fields along the Chay river to reach HCM HW(West wing). Lunch will take place en route at Chay Lap homestay. 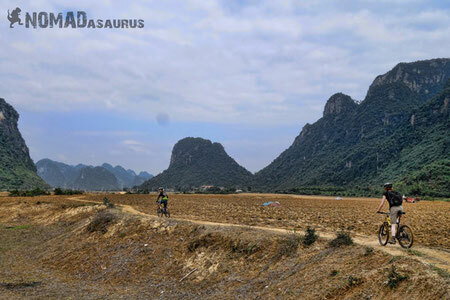 Later, cycle deep into the Phong Nha National Park. Stop at Nuoc Mooc Spring, where an eco-trail leads you to a prestine water swimming pool in the jungle! Free swimming. Leaving the National Park, you will cross the Chay river over a wooden bridge and visit to Wine Cave – where the V.C made rice wine during the time hiding bomb from the U.S aircraft. There is a symbol of peace still remained in the cave. A local ferry to cross Chay river will give you a chance to meet up with the best Russian speaking local man in the area. On the way back, stop at Ho Khanh’s house to learn about the caving passion of the King of the Cave Kingdom. Ho Khanh is the local jungle man who first found Hang Son Doong – the World’s Biggest Cave. He is working as the porter leader for the trip to Hang Son Doong. With luck, you can get a picture with this World-famous man. His wife serves the very best chocolate coffee. Back to the town about 16h30. Ice-cream break. Tour ends. - Boat on Son river, local ferry fees. Beyond August 2015 dates, itineraries and prices are indicative only.